What Voltage/Wattage Setting Should I Use For My Electronic Cigarette? There are many different electronic cigarette pens and clearomizers (tanks) on the market today… It makes it hard on new vapers; with all the new pens out today that have the variable voltage or wattage option to know what they should vape on! Well today we are going to help you when it comes to setting the correct voltage or wattage on your new electronic cigarette! I Just Bought A Variable Voltage and Wattage E-Cig And Don’t Know What Setting To Vape On?! Don’t Vape on Too High Of Voltage/Wattage! You Don’t Want To Fry Your Atomizer!! When finding the correct voltage or wattage to set your pen to, you want to check on the type of atomizer you have in your tank. Atomizers will usually vary from 1.5-2.1ohms. You are able to check what atomizer in your tank by looking on the box of the tank you purchased, or on most pens when you put your tank on the e-cig, your e-cig will show you the ohms of the atomizer on the digital screen. The voltage or wattage will depend on the ohms of the atomizer you have purchased. If you are vaping on a lower resistant atomizer, such as a 1.5ohms, you will want to vape at a lower voltage or wattage. If you are vaping on the higher end coil, such as the 2.1ohms, you will be able to go a little higher on the voltage or wattage. If you are vaping on the wrong level you run the risk of burning out your atomizer, and messing with the taste of your E-juice! You can view the chart below to make sure you are vaping at a good level! Taste Comes Into Factor When Selecting The Right Voltage or Wattage For Your Electronic Cigarette Pen! That’s right, the difference in voltage or wattage can change the taste of the E-juice you are vaping. If you use too high of a voltage or wattage, you can get a burnt taste from the E-juice. This burnt taste can also result from the coil burning out from vaping too high! With most E-juices, vaping on the right level (see chart above) will give you the best taste, and some even at a little lower of a level. The usual electronic cigarette pen is not meant to be used for blowing “clouds” which many beginning vapers try to do. Setting the voltage or wattage to it’s highest setting may give you a little more vapor, it will not be what you expect when it comes to taste! Some E-juices may vary and can be vaped at a higher voltage or wattage, it all depends on the E-juice company. Why Is My Battery Dying so Fast On My Electronic Cigarette? As said before, new vapers come into the vape world expecting to blow clouds! Setting your new electronic cigarette pen to the highest voltage or wattage may give you a little more vapor, but it will also burn through your battery quicker! The higher the voltage or wattage is set on, the faster the battery will drain. Setting your new VV/VW e-cig pen to a lower level will help with the battery longevity and will allow you to vape for a longer period of time! 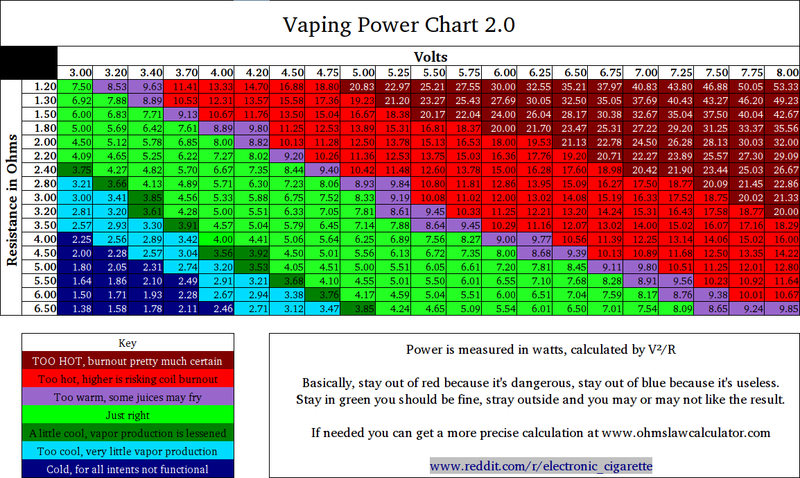 We recommend to always use the Vaping Power Chart above when selecting the correct voltage or wattage! If you have any questions regarding your new VV/VW electronic cigarette just comment below, call us at 1-800-266-7556, or email us at info@aspenvalleyvapes.com!! This entry was posted in Aspen Valley Vapes. Bookmark the permalink. Slam Dunk! Space Jam E-Juice Is Coming! Can I Bring My Electronic Cigarette On An Airplane? I’m using a .4 atomizer and I want to know the best setting for volts/Watts… My battery is draining really fast, it’s a 3.7volt 2500mah battery, and I’m running my Mod at 4.2volts/42.1watts currently. I don’t understand why my battery is draining so fast. Is the battery not powerful enough? Any suggestions? I just bought my eleaf istick tc60w mod with an aspire Triton drip tank. Works amazing, just the battery dies to quickly. Help me Aspen Valley, you’re my only hope! Amount of power in your battery = 2500 milli-Amp hoursn or 2.5 Amp for 1h. So with your setup, I would expect your battery to last around 14 min. You didn’t give an answer!!! Don’t worry tho I got your back! The answer is get a 3000mAh battery. But just so you know, the little pop-up in the left hand corner is VERY distracting [to me ;]. It makes it hard to read your great content. is it ok to use Boge 510 cartomizers on a Enokin T18 or T22 battery ? Hey is there a way to configure my pen to give short tokes, i want like 5 second toke not 10 sec is there someway? I just bought my e-cig and i set to 40w ..this too high? What is the normal watts?its getting hot quickly..
How do you set the appropriate power/watt. If my resistance is 1.14ohm, how do I set my pomwe (V)/watt )W)?